Here and in the rest of the post we will abuse notation by identifying elements of the special linear group with their equivalence class in ; this will occasionally create or remove a factor of two in our formulae, but otherwise has very little effect, though one has to check that various definitions and expressions (such as (1)) are unaffected if one replaces a matrix by its negation . In particular, we recommend that the reader ignore the signs that appear from time to time in the discussion below. and the Laplace-Beltrami operator, which can be computed to be (here we use the negative definite sign convention for ). As the metric was -invariant, all of these quantities arising from the metric are similarly -invariant in the appropriate sense. There are many further discrete subgroups of (known collectively as Fuchsian groups) that one could consider, but we will focus attention on these three groups in this post. Any discrete subgroup of generates a quotient space , which in general will be a non-compact two-dimensional orbifold. One can understand such a quotient space by working with a fundamental domain – a set consisting of a single representative of each of the orbits of in . This fundamental domain is by no means uniquely defined, but if the fundamental domain is chosen with some reasonable amount of regularity, one can view as the fundamental domain with the boundaries glued together in an appropriate sense. Among other things, fundamental domains can be used to induce a volume measure on from the volume measure on (restricted to a fundamental domain). By abuse of notation we will refer to both measures simply as when there is no chance of confusion. copies of a fundamental domain for in a rather complicated but interesting fashion. where is any fundamental domain for , that is to say a subset of consisting of exactly one representative for each right coset of . As is -automorphic, we see (if has suitable decay) that does not depend on the precise choice of fundamental domain, and is -automorphic. These operations are all compatible with each other, for instance . A key example of Poincaré series are the Eisenstein series, although there are of course many other Poincaré series one can consider by varying the test function . whenever are discrete subgroups of , is a -automorphic function with sufficient decay on , and is a -automorphic (and thus also -automorphic) function of reasonable growth. These identities will allow us to move fairly freely between the three domains , , and in our analysis. When computing various statistics of a Poincaré series , such as its values at special points , or the quantity , expressions of interest to analytic number theory naturally emerge. We list three basic examples of this below, discussed somewhat informally in order to highlight the main ideas rather than the technical details. of the sum (7). Note from multiplicativity that (7) can be written as , which is superficially very similar to (10), but with the key difference that the polynomial is irreducible over the integers. which (up to a harmless sign) is exactly the representation , , introduced earlier, and leads to the same reformulation of the sum (10) in terms of expressions like (11). Similar considerations also apply if the quadratic polynomial is replaced by another quadratic, although one has to account for the fact that the class number may now exceed one (so that unique factorisation in the associated quadratic ring of integers breaks down), and in the positive discriminant case the fact that the group of units might be infinite presents another significant technical problem. Note that has real part and imaginary part . Thus (11) is (up to a factor of two) the Poincaré series as in the preceding example, except that is now the indicator of the sector . Sums involving subgroups of the full modular group, such as , often arise when imposing congruence conditions on sums such as (10), for instance when trying to estimate the expression when and are large. As before, one then soon arrives at the problem of evaluating a Poincaré series at one or more special points, where the series is now over rather than . is a certain integral involving and a parameter , but which does not depend explicitly on parameters such as . Thus we have indeed expressed the expression (13) in terms of Kloosterman sums. It is possible to invert this analysis and express varius weighted sums of Kloosterman sums in terms of expressions (possibly involving inner products instead of norms) of Poincaré series, but we will not do so here; see Chapter 16 of Iwaniec and Kowalski for further details. for and non-zero are generalised eigenfunctions of (with eigenvalue ), and are almost square-integrable on (the norm diverges only logarithmically at one end of the cylinder , while decaying exponentially fast at the other end ). This equation somewhat resembles a “Klein-Gordon” type equation, except that the mass is imaginary! This would lead to pathological behaviour were it not for the negative curvature, which in principle creates a spectral gap of that cancels out this factor. This post originated from an attempt to finally learn this part of analytic number theory properly, and to see if I could use a PDE-based perspective to understand it better. Ultimately, this is not that dramatic a depature from the standard approach to this subject, but I found it useful to think of things in this fashion, probably due to my existing background in PDE. I thank Bill Duke and Ben Green for helpful discussions. My primary reference for this theory was Chapters 15, 16, and 21 of Iwaniec and Kowalski. I’ve just uploaded to the arXiv the paper “Finite time blowup for an averaged three-dimensional Navier-Stokes equation“, submitted to J. Amer. Math. Soc.. The main purpose of this paper is to formalise the “supercriticality barrier” for the global regularity problem for the Navier-Stokes equation, which roughly speaking asserts that it is not possible to establish global regularity by any “abstract” approach which only uses upper bound function space estimates on the nonlinear part of the equation, combined with the energy identity. This is done by constructing a modification of the Navier-Stokes equations with a nonlinearity that obeys essentially all of the function space estimates that the true Navier-Stokes nonlinearity does, and which also obeys the energy identity, but for which one can construct solutions that blow up in finite time. Results of this type had been previously established by Montgomery-Smith, Gallagher-Paicu, and Li-Sinai for variants of the Navier-Stokes equation without the energy identity, and by Katz-Pavlovic and by Cheskidov for dyadic analogues of the Navier-Stokes equations in five and higher dimensions that obeyed the energy identity (see also the work of Plechac and Sverak and of Hou and Lei that also suggest blowup for other Navier-Stokes type models obeying the energy identity in five and higher dimensions), but to my knowledge this is the first blowup result for a Navier-Stokes type equation in three dimensions that also obeys the energy identity. Intriguingly, the method of proof in fact hints at a possible route to establishing blowup for the true Navier-Stokes equations, which I am now increasingly inclined to believe is the case (albeit for a very small set of initial data). purely for the velocity field, where is a certain bilinear operator on divergence-free vector fields (specifically, . The global regularity problem for Navier-Stokes is then equivalent to the global regularity problem for the evolution equation (1). This identity (and its consequences) provide essentially the only known a priori bound on solutions to the Navier-Stokes equations from large data and arbitrary times. Unfortunately, as discussed in this previous post, the quantities controlled by the energy identity are supercritical with respect to scaling, which is the fundamental obstacle that has defeated all attempts to solve the global regularity problem for Navier-Stokes without any additional assumptions on the data or solution (e.g. perturbative hypotheses, or a priori control on a critical norm such as the norm). admits solutions that blow up in finite time. 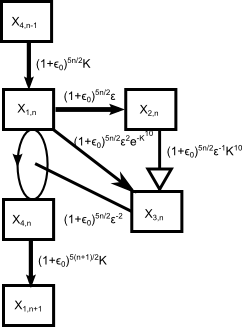 Because spatial rotations and Fourier multipliers of order are bounded on most function spaces, automatically obeys almost all of the upper bound estimates that does. Thus, this theorem blocks any attempt to prove global regularity for the true Navier-Stokes equations which relies purely on the energy identity and on upper bound estimates for the nonlinearity; one must use some additional structure of the nonlinear operator which is not shared by an averaged version . Such additional structure certainly exists – for instance, the Navier-Stokes equation has a vorticity formulation involving only differential operators rather than pseudodifferential ones, whereas a general equation of the form (2) does not. However, “abstract” approaches to global regularity generally do not exploit such structure, and thus cannot be used to affirmatively answer the Navier-Stokes problem. where is a small parameter, are Schwartz vector fields whose Fourier transform is supported on an annulus, and is an -rescaled version of (basically a “wavelet” of wavelength about centred at the origin). Such operators were essentially introduced by Katz and Pavlovic as dyadic models for ; they have the essentially the same scaling property as (except that one can only scale along powers of , rather than over all positive reals), and in fact they can be expressed as an average of in the sense of the above theorem, as can be shown after a somewhat tedious amount of Fourier-analytic symbol manipulations. where are scalar fields for each integer . (Actually, Katz-Pavlovic worked with a technical variant of this particular equation, but the differences are not so important for this current discussion.) Note that the quadratic terms on the RHS carry a higher exponent of than the dissipation term; this reflects the supercritical nature of this evolution (the energy is monotone decreasing in this flow, so the natural size of given the control on the energy is ). There is a slight technical issue with the dissipation if one wishes to embed (3) into an equation of the form (2), but it is minor and I will not discuss it further here. In principle, if the mode has size comparable to at some time , then energy should flow from to at a rate comparable to , so that by time or so, most of the energy of should have drained into the mode (with hardly any energy dissipated). Since the series is summable, this suggests finite time blowup for this ODE as the energy races ever more quickly to higher and higher modes. Such a scenario was indeed established by Katz and Pavlovic (and refined by Cheskidov) if the dissipation strength was weakened somewhat (the exponent has to be lowered to be less than ). As mentioned above, this is enough to give a version of Theorem 1 in five and higher dimensions. The purpose of this post is to link to a short unpublished note of mine that I wrote back in 2010 but forgot to put on my web page at the time. Entitled “A physical space proof of the bilinear Strichartz and local smoothing estimates for the Schrodinger equation“, it gives a proof of two standard estimates for the free (linear) Schrodinger equation in flat Euclidean space, namely the bilinear Strichartz estimate and the local smoothing estimate, using primarily “physical space” methods such as integration by parts, instead of “frequency space” methods based on the Fourier transform, although a small amount of Fourier analysis (basically sectoral projection to make the Schrodinger waves move roughly in a given direction) is still needed. This is somewhat in the spirit of an older paper of mine with Klainerman and Rodnianski doing something similar for the wave equation, and is also very similar to a paper of Planchon and Vega from 2009. The hope was that by avoiding the finer properties of the Fourier transform, one could obtain a more robust argument which could also extend to nonlinear, non-free, or non-flat situations. These notes were cited once or twice by some people that I had privately circulated them to, so I decided to put them online here for reference. UPDATE, July 24: Fabrice Planchon has kindly supplied another note in which he gives a particularly simple proof of local smoothing in one dimension, and discusses some other variants of the method (related to the paper of Planchon and Vega cited earlier).